Say 'hello' to Napoleon, Snowball and Squealer (of course)! 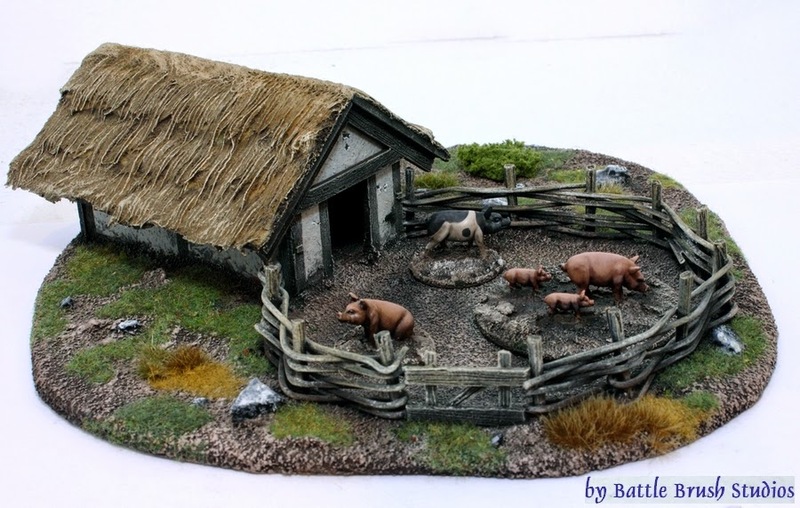 Finally that pigsty I built about two years ago got some livestock to serve its original purpose! Pigs of course make for great "dynamic" mission objectives through all settings and periods in which people enjoy the taste of bacon. As I play a variety of Fantasy, Sci-Fi and historical settings I always aim for very "general purpose" terrain and objectives. ;) I very vividly remember a game of Dux Britanniarum (Saxon Raiders vs. Romano-Britons. Excellent, excellent set of rules.) in which I, as the Saxon Raiders, had to drive a few pigs my boys just had nicked from a British village across the table and back into my camp's safety before the angry Britons would catch up to get their stuff back. Of course the pigs did not cooperate and I had to leave all but one behind. The rest of the pigs just ran off into a forest, away from the Saxons and Britons alike. The models are by Architects of War. I bought them at Austrian Salute. Here's my report of this fine day out!